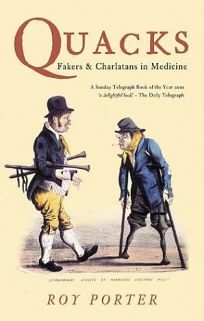 The late Porter, whose Cambridge Illustrated History of Medicine and The Greatest Benefit to Mankind were wide-ranging collections of medical practices through the ages, turned his attention to the fringes of the field in this illuminating book. Originally published in 1989, it has been updated with 63 color and b&w illustrations, mostly engravings and etchings from the 18th and 19th centuries. Although the word ""quack"" is decidedly negative, Porter himself does not judge, and he reveals that among the nostrum vendors, snake charmers and other charlatans of early quackdom there were also people making significant contributions to the art of healing. Some practitioners dismissed as quacks were Jewish, or women, and therefore subject to the mistrust and prejudice of antiquated medical establishments. Others failed to follow the rules of medical commerce and either gave their legitimate medicines away or kept the ingredients secret. But purposeful fakers and exploitation artists are the main subject here, and Porter has a field day examining their careers, both successful and failed. In the early days of medicine, quack doctors appealed to the masses by using a combination of brilliant marketing strategies and itinerant habits. They also""asserted point-blank that their medicines were universally effective and therapeutically nonpareil."" This confidence, combined with carefully set prices, gave potential customers the perception that they were getting more for their money than they could from a legitimate physician. Porter compares this phenomenon to some alternative medical therapies of today, while carefully sidestepping judgments of efficacy in most cases. Detailed, long, and Anglo-centric, this book does not offer a breezy popular history, but rather a finely written and researched examination of the human ability to deceive and be deceived.